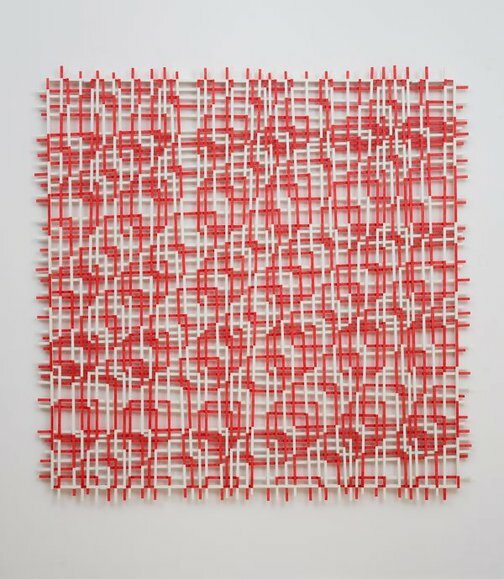 'RES' 2010 constitutes Hilarie Mais' current search and discovery for new modes of 'abstract visualisation' with and from within the grid, as defined by 'formational principles of natural occurrence' (Wright, 2012). Mais has been critically engaged with this archetype since her Sydney Biennale installation 'Doors, thoughts: the maze' 1986, explaining that 'It is such a loaded historical structure, a modernist and ancient form, a layered icon. As with the spiral it has historical and cultural associations'. The sculpture/painting has been irregularly assembled from varying lengths of interlocking vertical and horizontal wooden sticks, contained neither by frame or border. Mais has then hand-painted a scheme of interlinking pure red squares that are at once a description and outcome of its 'growth system' i.e. the decisions and steps made during the construction of the form. 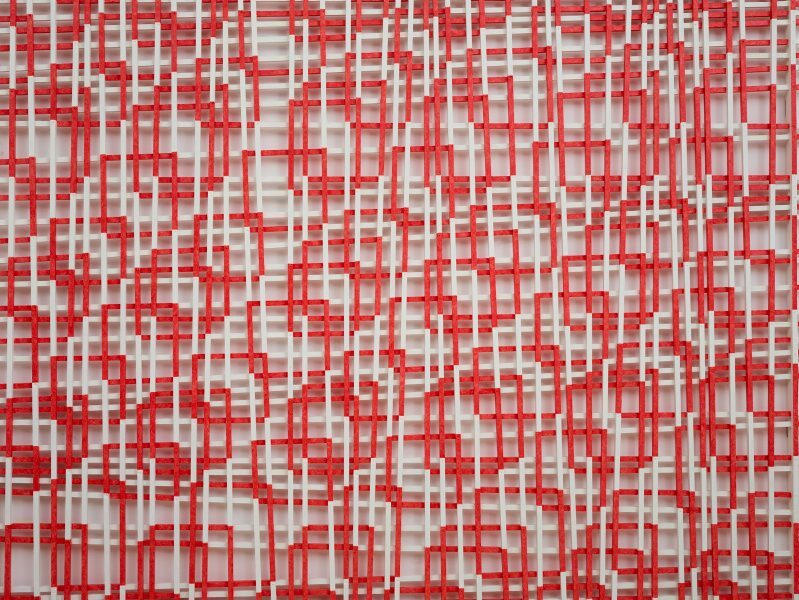 'RES' is what the artist classifies an 'Indentifying structure'- viewed from a distance we instinctively experience Gestalt as the eye registers space and volume, the mind perceiving a unified network of cubes inside this shallow relief. In Latin the title 'res' translates to a nonspecific 'thing' or 'occurrence'; appropriate considering how the artwork has generated organically from somewhere within itself. Signed u.r. verso, black fibre-tipped pen "Hilarie Mais". Dated u.l. verso, black fibre-tipped pen "... 2010". Drill Hall Gallery, Australian National University (Compilator), ANU Drill Hall Gallery: Exhibition Program 2011 , 'Triptych: Mais, Mais Wright, Wright', Canberra, 2011, n.pag. (colour illus.). Michael Fitzgerald (Editor), Art Monthly Australasia , Canberra, Sep 2017, front cover (colour illus.). Sally Prior., The Canberra Times , 'Turning family tradition into an art form', Canberra, 29 Sep 2011, (colour illus.). 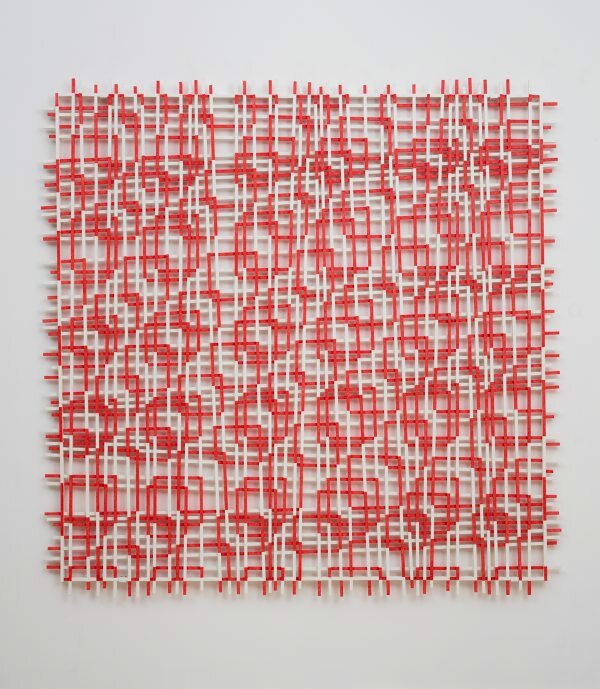 William Wright., Hilarie Mais, Identifying Structures , 'Hilarie Mais, Identifying Structures', Sydney, 2012, n.pag..